A few weeks back I had written and posted a blog on the 2008 Kunde Family Estate Zinfandel. 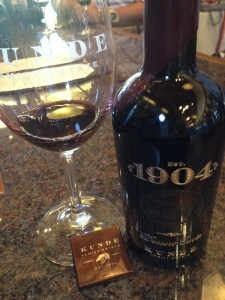 I Also added the blog link to the Kunde Facebook Page saying we had enjoyed a bottle of 2008 Zinfandel for dinner. 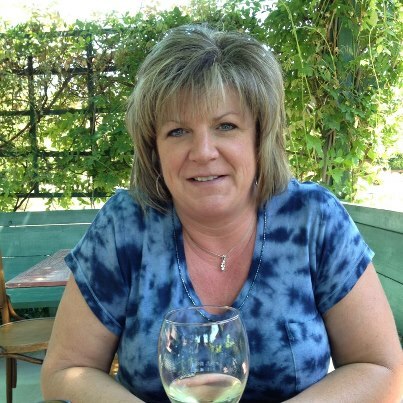 A few days later I received an email from Marcia Kunde Mickelson thanking me for the blog. 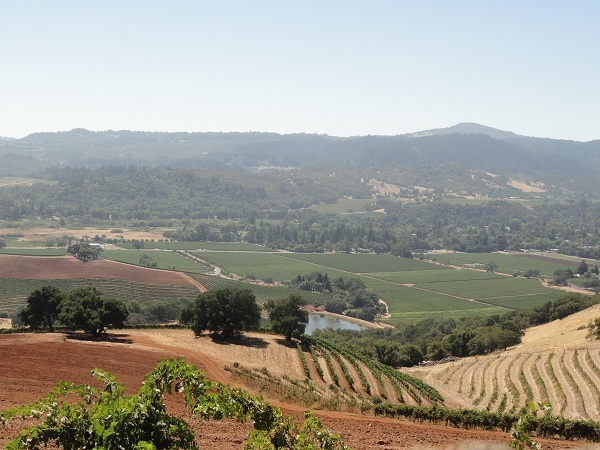 Making a great email better, Marcia hoped a future Sonoma travel would allow us time to stop by Kunde for a Hilltop Tasting. 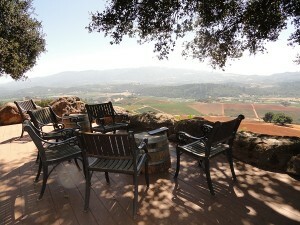 Well as luck would have it we had a trip scheduled and we were able to take advantage of a Hilltop tasting! I had traveled to California midweek for work. Chris joined me as well as she was planning to spend a few quality days relaxing and bumming around Santa Clara and Sunnyvale while I worked. 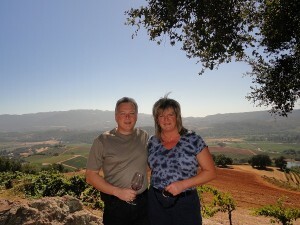 Friday could not come to fast and we were on the road heading to Sonoma. After we finished eating, we drove around seeing the sites before heading over to Kunde. 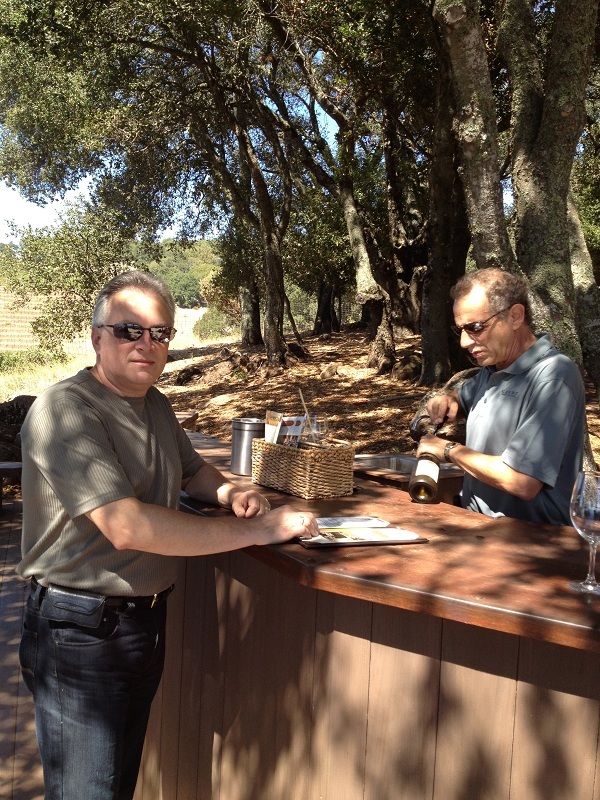 We entered the tasting room and just like the last time – were greeted by hospitality. 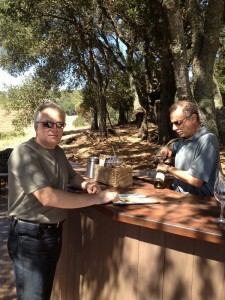 I mentioned we had a “Hilltop Tasting” and immediately the gentleman asked “are you Bill”? With no hesitation I said “Yes”! I shook his hand and introduced Chris. After the brief introductions we were told to head over to the side tasting table where Len was talking to another couple from New York. A few more introductions and we were off to the van. Before we were on our way Len poured us a glass of the Sauvignon Blanc and once at the van we were greeted by another couple from Texas. 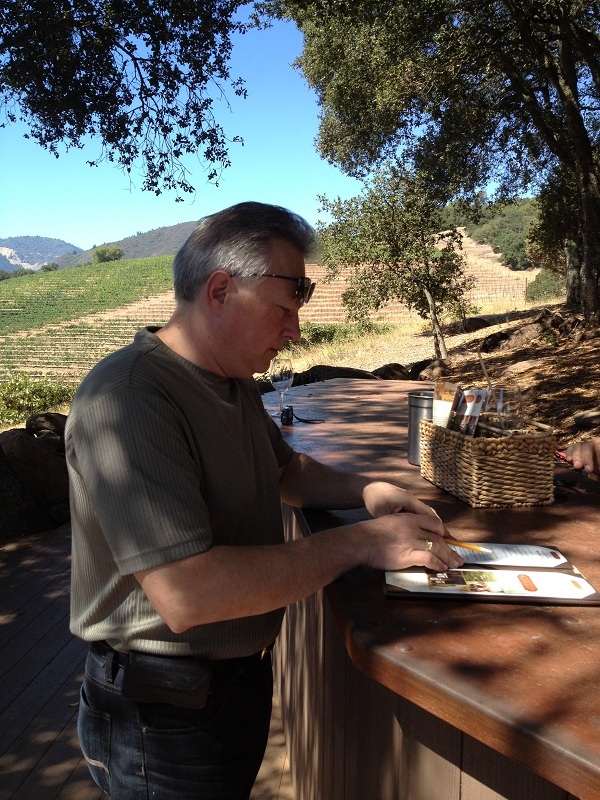 On the drive up Len started talking about the history of Kunde. Our first stop was by an old boxing ring. 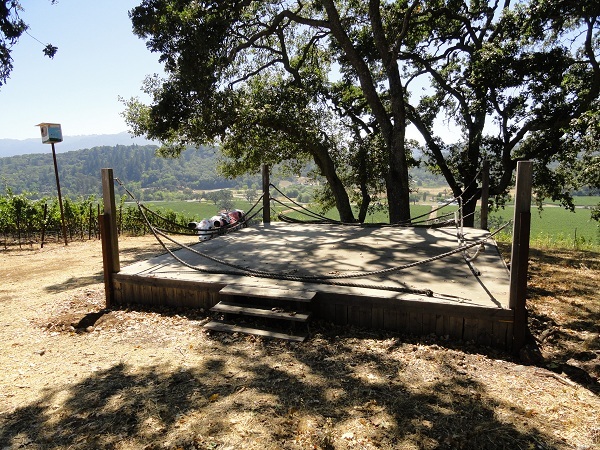 If you are familiar with the movie “Bottle Shock“, much of the movie was shot on the Kunde Family Estate. If you have not seen the movie I would recommend it. We continued our drive until we reached the top of the hill at 1400 feet. The views were amazing and we could see for miles. The tasting area had many tables and chairs but if you prefer to stand like I do, there is a tasting stand where Len had the bottles of wine we were going to enjoy. Outstanding view from the Hilltop! By now we had started a pretty good conversation with Dan and Carrie from New York and we were really enjoying our time with them! Me and my honey. Thanks for taking the picture Dan! Len continued talking about the estate and the wines. The first wine we sampled was the Reserve Chardonnay. It was buttery and crisp and the finish was nice. We could taste pear and melon and I rated the Reserve Chardonnay three glasses. Bill with Len pulling a cork! It was time for the reds and the first one Len served was the 2008 Zinfandel. If you recall, this was the one I blogged a few weeks back. We continued with Zinfandels and Len poured us all the 2009 Century Old Vine. Some of the aromas were spice and bright fruit. I think Len also mentioned he noticed a hint of Mint? The tannins approached my mid palate and worked its way towards the sides. The finish was nice and long. To me this was a full bodied Zin and I would rate this one 3 plus glasses! Continuing through the reds we tasted the 2009 “Red Dirt Red”, which was an interesting blend. 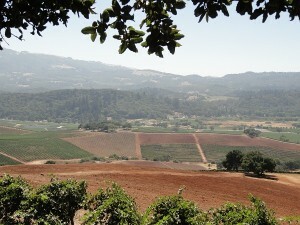 The varietals were Barbera, Petite Syrah, Syrah, Sangiovese, and Zinfandel. Tasting the Red Dirt Red I noted that it was a little dry (more tannins) and I could taste Bing Cherry Fruit. Dan especially like this one and he bought some when we returned to the tasting room. The final red wine was the 2009 Reserve Cabernet Sauvignon. Tasting this one; I thought it needed some happy time in the cellar. It was a little dry and the tannin’s were felt in the middle of my tongue with a long finish. We spent roughly an hour on the Hilltop talking to our new friends (Len too!). 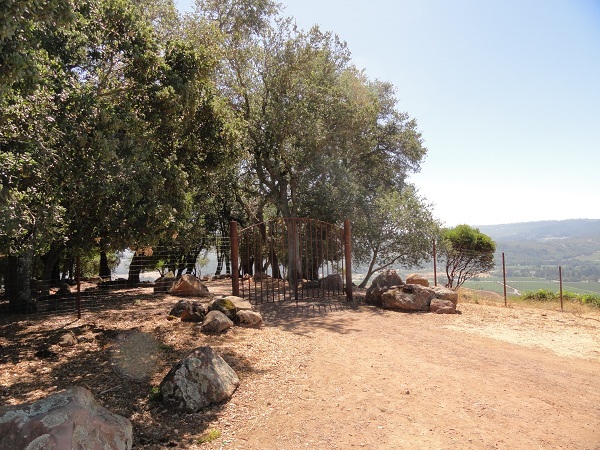 As we drove back Len talked about how the Kunde family cares about the history of the land. Before a new plot is dug and planted they have it assesed. There have been many locations on the property where they have found Indian Artifacts. If artifacts are found, the land is NOT planted and is left as is. I have to say kudos to the Kunde family for respecting the Indians! We ended the tour with all of us venturing into the tasting room. 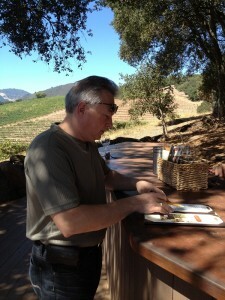 As a treat, Len pulled out a bottle of the desert Cuvee which was a terrific ending to a beautiful day on the Hilltop. We were initially planning to bring back a case of wine for our friends Dave and Heather from their existing wine club order, but unfortunately for them, we bought our own case of wine and needed the wine check! We purchased six bottles of the 2011 Wildwood Chardonnay, four of the 2011 Sauvignon Blanc – Block 4SB20 and two bottles of the 2009 Reserve Century Vines Zinfandel. We also took home two bottles of the 1904 Dessert Cuvee that I figure I would share with Dave since we didn’t help them with their wine. As we were purchasing our wine from Len, we had the opportunity to meet Marcia Kunde Mickelson and were very pleased to meet her! I believe that its important to meet the wine makers or family members of the wineries that I visit. We appreciate the hospitality sincerely! If you are in Sonoma, the Hilltop tasting at Kunde is a must do! The time spent was excellent and the experience deserves a five glass rating! We are looking forward to our Italy cruise and hope to meet Jeff Kunde during the trip. Another great blog post and thanks again for visiting Kunde Family Estate. Marcia is very fond of you and Chris and we really appreciate the time you have spent with us and sharing your experiences with your readers here. Please let us know the next time you are in town.